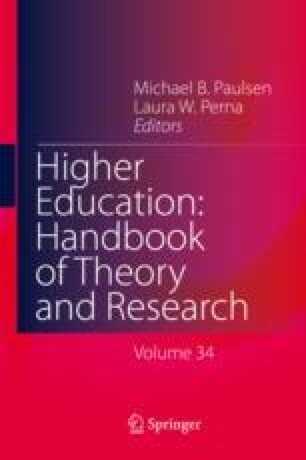 In this chapter, we review the literature on college access and choice, as well as advance a model of college-going that integrates both student and institutional actions and factors that shape choice sets, lead to a specific college choice, and account for changes in the process and system over time. The model we advance features six stages: (1) Available postsecondary options shape students’ preferences, (2) Individual, family, and community circumstances moderate students’ responses, (3) Students signal ability and interest to their preferred institutions, (4) Institutions use incentives to alter specific students’ available choices, (5) Students choose from their available option, and (6) The system changes over time. We illustrate the utility of the model in applications to four student populations, students from rural communities, first-generation college students, students with disabilities, and student-athletes. The chapter concludes with quantitative and qualitative data sources, methodological approaches, and future research directions informed by the central features of the model. Hu, S. (2003). Educational aspirations and postsecondary access and choice: Students in urban, suburban, and rural schools compared. Education Policy Analysis Archives, 11(14). Retrieved from https://epaa.asu.edu/ojs/article/viewFile/242/368.